If you include Beijing and Tianjin within Hebei, it would be by far the most important province in China, but even without them Hebei is still of great significance. It stretches well beyond the Great Wall into the northern Mongolia plateau down to one of the Yellow River's ancient channels to the sea in the South. It is from its position north of the Yellow River (Huang He) that it gets its name. It slopes from high mountains in the north-west down to the fertile alluvial plain in the south-east. It has been part of China from earliest times, at least as long ago as the Shang dynasty. Shijiazhuang, the provincial capital, boasts a memorial to the Canadian doctor Norman Bethune ➚ and Indian Dwarkanath Kotnis ➚ who helped the Communist Army in the Japanese Occupation. It is a modern city and a major railway junction. Baoding was the former provincial center has Ming dynasty city walls. Between Shijiazhuang and Baoding on the main railway line to Beijing is the village of Wangdu which is a more ancient place as well as two Han dynasty tombs. Zhengding to the north of Shijiazhuang and has the Song dynasty Dafo Temple. Handan and other cities in the south of Hebei have a more ancient feel to them. Zhaozhou has the ancient Anji stone bridge ➚ dating back 1,400 years; the oldest open-spandrel arch bridge in the world. 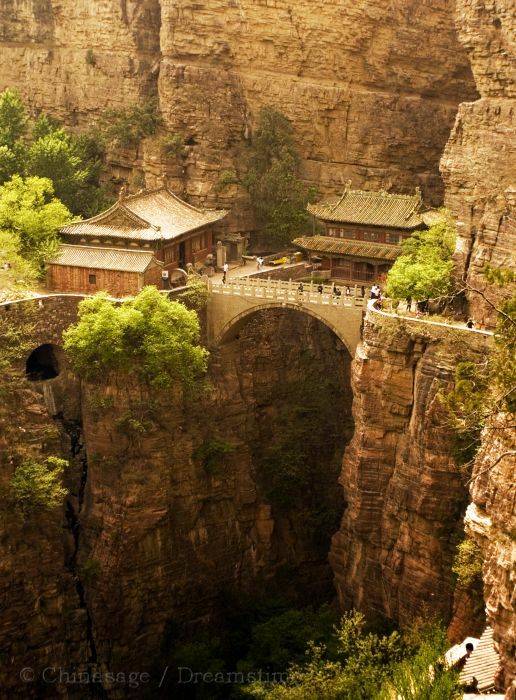 Jingxing near the Shanxi border is famous for the ‘Hanging Palace of the Green Cliff’. Qinhuangdao near the border with Liaoning has European influenced beach resorts including Beidaihe ➚ which is frequented by the Chinese élite. Nearby at Shanhaiguan there is an impressive fort where the Ming dynasty Great Wall dramatically reaches the sea. Inland, part of the Wall is submerged in the Panjiakou Reservoir ➚. The Great Wall cuts across the northern half of the Province and is Hebei's main tourist attraction. Zhangjiakou (Kalgan) has been an important trading center near the Wall for centuries. Jixian has two fine old temples. 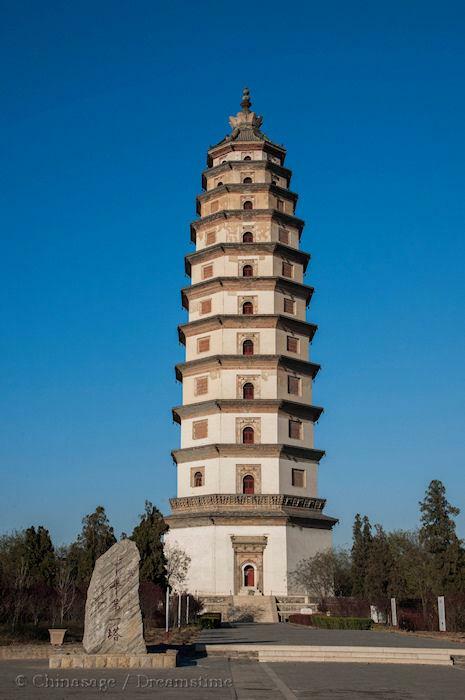 Fengrun is famous for its tall octagonal pagoda. Cangyan Shan ➚ in the south-west has an impressive collection of monasteries set amongst the mountains while Zhangshi Crag National Park has breathtaking scenery. Each dynasty in China had its own Imperial burial ground. The Manchu or Qing dynasty have some tombs 78 miles [125 kms] east of Beijing hence its name 清东陵 Qīngdōng líng Eastern Qing Tombs and some to the west 清西陵 qīngxī líng Western Qing Tombs. The sites were carefully chosen for the very best Feng Shui. The Eastern Qing tombs are located just inside Hebei province and south of the Great Wall. There are the tombs of five emperors, fifteen empresses and over a hundred concubines. After the fall of the dynasty in the 1920s, the tombs were extensively plundered. The structure of both Qing tomb complexes follows the traditional Han Chinese format, a Sacred or Spirit Way guarded by stone animals and officials leads to a site at the foot of a mountain. In the Eastern group, the largest central tomb (Xiaoling) is that of Shun Zhi, the founder of the dynasty. The area has a number of ornamental arches, bridges and halls. The long lived Emperor Qianlong has the finest tomb, it was started when he was 30 and he went on to live to the age of 88. Dowager Empress Cixi has a large and impressive tomb, and to emphasize her control in this case the Phoenix (representing the Empress) is shown dominating the Dragon (representing the Emperor). The Western Qing Tombs are located 87 miles [140 kms] south-west of Beijing and houses the remains of ten emperors. When Emperor Qianlong was advised that the Eastern Qing tomb site had superior Feng shui, he dictated that burials should alternate between the two necropolises. Unlike the Eastern Tombs these have not been plundered or excavated. A special railway line was built, originally reserved for use by only the Imperial family and courtiers. Not content with just the Forbidden City and Summer Palace, the Qing Emperor Kangxi created a mountain resort at Chengde in 1703 to escape the summer heat of Beijing. It was called 避暑山庄 Bìshǔ Shānzhuāng, literally ‘Mountain villa to avoid the heat’. It took 87 years to complete. Kangxi and the emperors following him, spent the summer months at Chengde, often in outdoor pursuits such as hunting in the hills. It reminded the Manchu rulers of their origins as herdsmen of the northern plains. Chengde was also known as Jehol or Rehe in pinyin after an old name for the whole province of which it was the capital. It was here that British ambassador Earl MacCartney sought a trade agreement with China in vain in 1793. Chengde gradually grew to be even larger than the Imperial Palaces in Beijing. There are replicas of many buildings of traditional and regional architecture dotted around lakes with linking walkways. The Putuozongcheng Miao is a replica of the Potala Palace, Lhasa and was built for the visit of the Panchen Lama in 1780. Pule Si ➚ or ‘Temple of Universal Joy’ has a conical yellow roof rather like the Temple of Heaven in Beijing. Wenjin Pavilion ➚ housed a great collection of books. The perimeter wall is reminiscent of the Great Wall. Just outside the walls isPuning Sia temple that commemorates the defeat of Mongol rebels and has a Tibetan style and is a working monastery. It has a huge statue of Guanyin. Chengde fell into ruin after the foundation of the Republic of China and only after recent painstakingly careful restoration has it become a major tourist attraction. Tangshan just east of Beijing was the epicenter of China's worst earthquake in recent years, on Jul 28 1976 when 650,000 people ➚ lost their lives. It was midnight on the 28th of July, 1976. Shaken half-awake, I was dully aware that something strange was happening. I could feel the ground under me jerking back and forth, up and down. Before I could make out what was really happening, the roof had collapsed and I was half buried under it. Then I realized, this was an earthquake! People in Beijing were also badly affected. Tens of thousands of people camped out in Tian'anmen Square for two months. 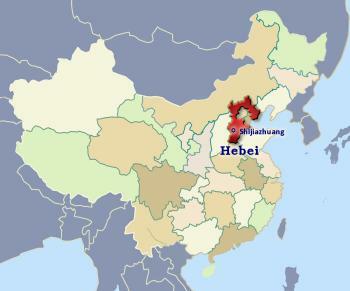 From the Ming dynasty up until 1928 the area covered by Hebei was part of ‘Zhili (直隶)’ also known as Chihli WG, which was directly administered by the Emperor - as it included the capital - rather than as a separate province. The province was not greatly developed until recently, the repeated droughts and flooding from Yellow and Hai rivers made agriculture and building on the plain too perilous. Extensive water management now makes agriculture economic. Shijiazhuang, a busy industrial and railway town, became the provincial capital when Tianjin was hived off as a metropolitan ‘province’ level district in 1968. The city them grew rapidly in the last hundred years as the main railway hub for northern China. The province is heavily industrialized, producing machinery; textiles; coal (Kailuan Coal Mines near Tianjin); oil fields (offshore in the Bohai Gulf) as well as steel and chemicals. The flat alluvial soils made by the Yellow River over the centuries created rich agricultural land that produce copious wheat; cotton; corn and tobacco. 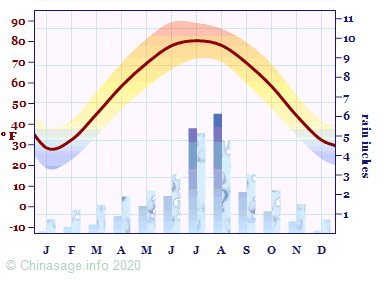 The province has cold winters and hot, humid summers with rainfall restricted to mainly July and August. The northern part suffers from vast dust storms which bring sand and dust from the Gobi desert. 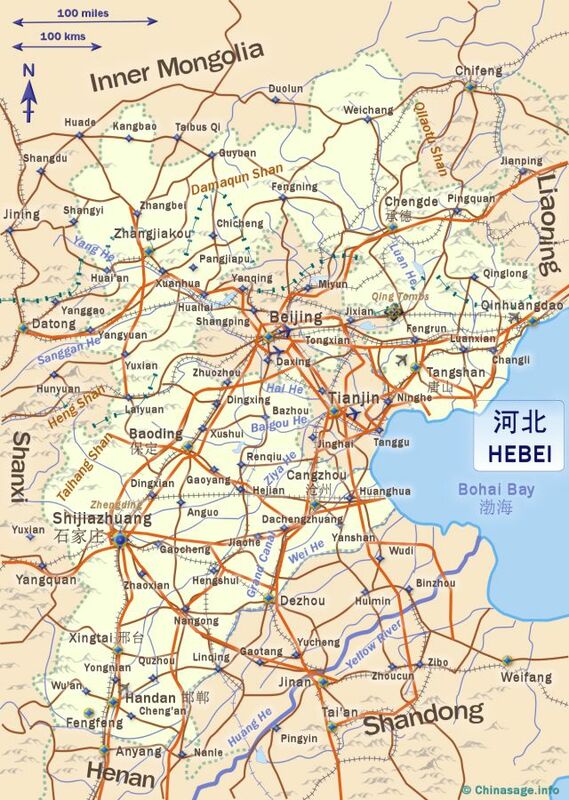 Citation information for this page : Chinasage, 'Hebei, northern China', last updated 3 Dec 2018, Web, http://www.chinasage.info/maps/hebei.htm.